Take a trip across the Potomac River. If you've had an especially fruitful weekend in The Division 2's post-apocalyptic capital, you're probably on the look out for some fresh challenges in the endgame. 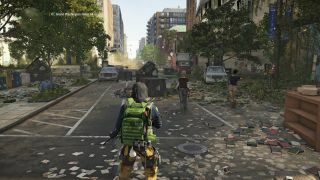 There's quite a bit to do once you hit level 30, as Samuel points out in his The Division 2 review-in-progress, but you'll need a wait a bit longer for the first raid, Dark Hours. A recent datamine, however, provides some potential hints about what you'll be doing. Kevindavid40 posted the results of their datamine on Reddit after uncovering details about the raid's location and the objectives groups of agents will need to complete. It's a pretty long list. According to the datamine, agents will need to head to Arlington Island, first crossing the Arlington Memorial Bridge. As far as I can tell—as a Scot with Google Maps—only one of them is a real location. The Arlington Memorial Bridge connects the city with Arlington County, across the Potomac River. Arlington Island could refer to Columbia Island, however, which is where the bridge deposits people. From there, it's a short hop over to the famous Arlington National Cemetery. The objective list, which is out of sequence, suggests the walk across the bridge won't be a peaceful one, and it probably won't get better once you cross the Potomac, either. Check out the list below. Four raid trophies were also dug up, with players being awarded them for making it through the bridge in one hour or less, have your most kills with signature weapons, killing any of the hunters who have killed you before and fleeing from interceptors in less than two minutes. Now, the bridge is just the access point, apparently, so if it could take up to an hour to get across, it's looking like a long raid. Also discovered was a new mission, Nighthawk, which appears to be connected to the raid. The dataminer reckons it will need to be triggered from within the raid, though like all the other datamined details, any of this could change or already be out of date. I've been taking my time—and dying a lot—so I'm not even thinking about The Division 2's endgame yet. I'm still planning my first Dark Zone expedition, so it will be some time until I need to worry about raids. I'm really enjoying just running and sneaking through DC, uncovering hidden loot and stopping naughty gangs from executing people and hijacking our speakers, and I'm not feeling compelled to rush through it all, in contrast to many of its fellow looter shooters. Ubisoft has yet to reveal the raid officially, but with the game now out in the wild, expect that to change in the near future.